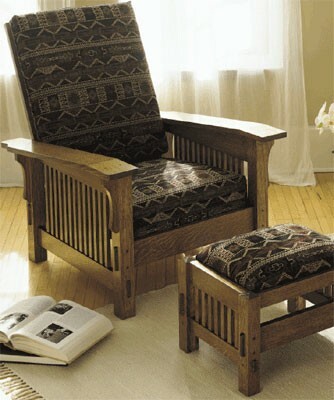 Morris Chair: The Mission-style (or Arts & Crafts) version of a Lay-Z-Boy. 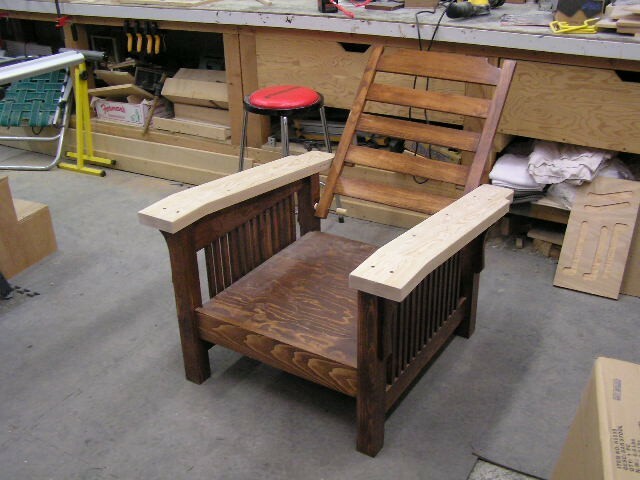 My sister-in-law expressed interest in my making a Morris Chair for her. She wanted it made of hemlock. 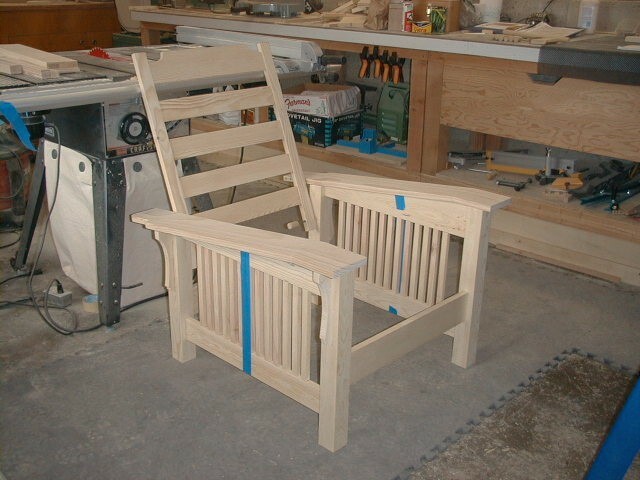 Since that's not very easy to work with I made much of it out of pine. I got the plans (first two pix) online, and I would recommend you get those also (the pictures here are not enough). Contrary to the plans, I used only 3/4" boards except for the arms. After experimenting with copper re-inforced peg holes I decided it would be better all around to make the arms of 2 x 6 hemlock boards. They came out very nice. 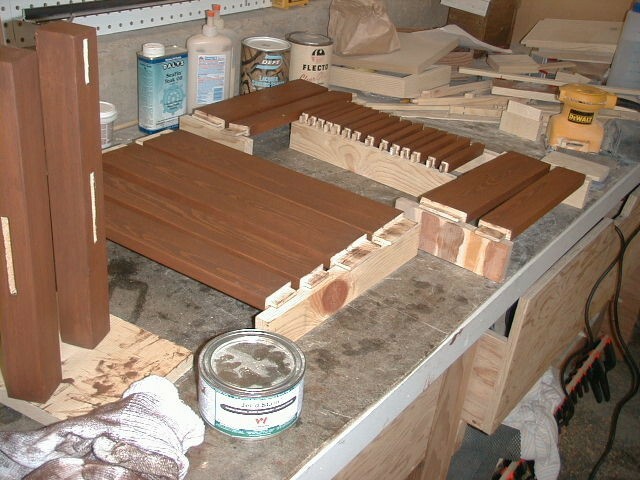 The wood is stained with Wood Kote's Jel'd Stain (Dark Mahogany) and finished with six coats of the same company's clear satin finish. 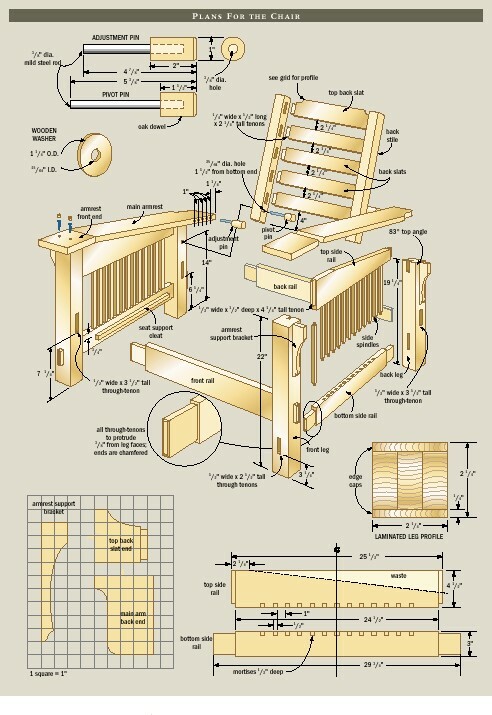 If you're planning to make one of these I have two suggestions. 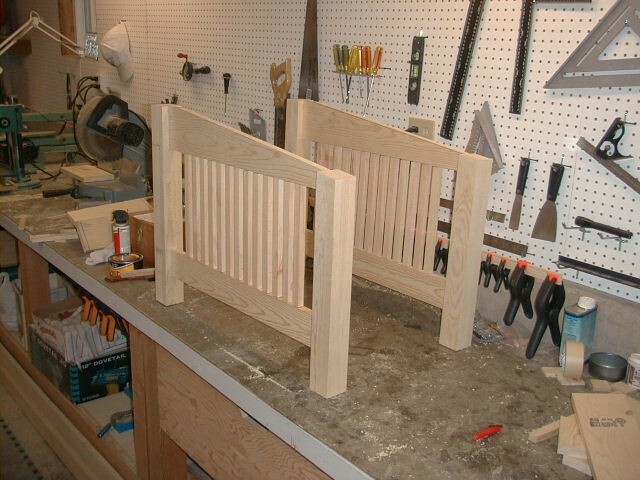 I didn't make the through-tenons shown. 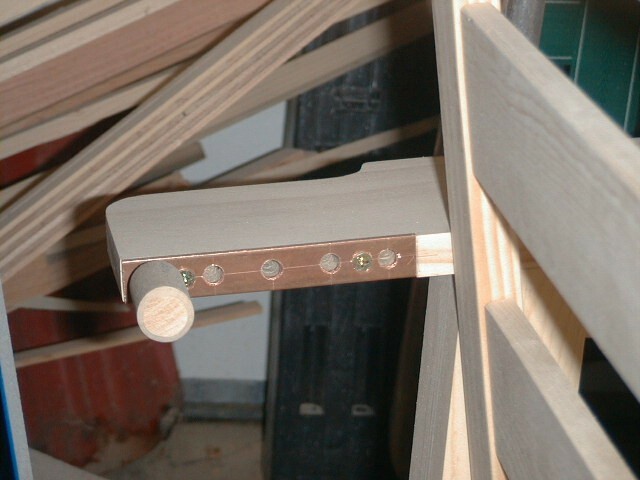 I prefer the cleaner look of blind-tenons, plus they are much more forgiving should you have tear-outs on the tenon ends, e.g., or if your mortises don't produce air-tight fits with your tenons. Also, the cleats shown on the side rails for holding the seat cushions seem mis-placed to me. 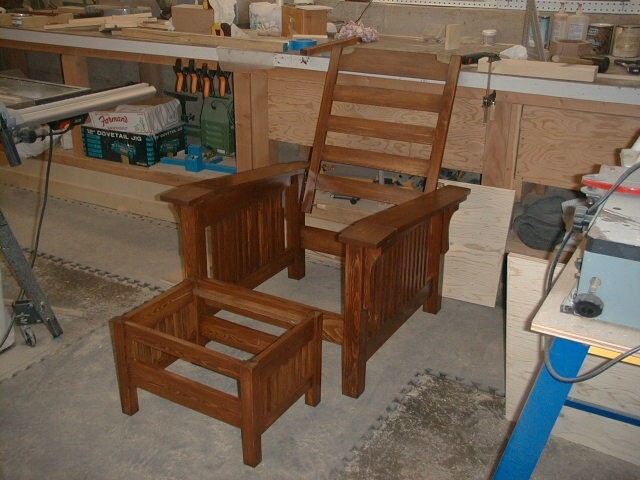 To get the cushion tops up to a level with the ottoman tops would have required a 9 or 10 inch cushion -- much easier to put the cleats higher up, which you can only do on the front and back rails. My sister-in-law will be taking care of the upholstering. When that's done I'll add some more pictures. 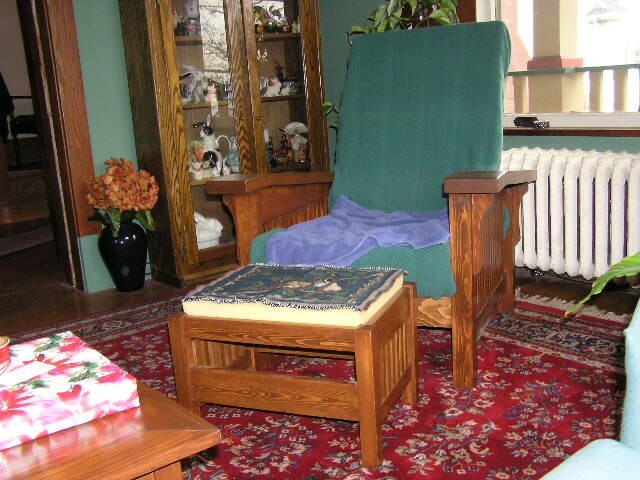 We delivered the chair as a Christmas surprise while she was at work. When we later arrived for the holiday she had temporarily covered the cushions with a throw. 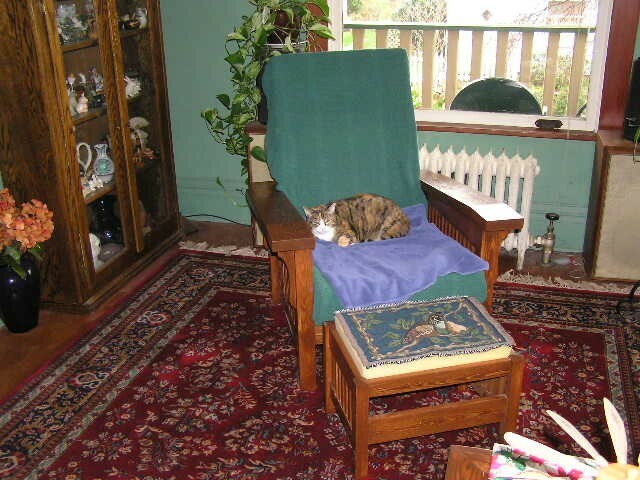 Her cat Rhubarb claimed the chair and would not leave (except when I tried to take pictures of her). The original site from which these plans came seems to have been shut down, but another site has essentially the same plans; from the picture (far right) I'd say it's much more like the one I actually made ... no through tenons).